The 2005 Ford GT has proven itself to be a classic muscle car and an exotic sports car. Great handling, quick acceleration and great top speed just as delivered. 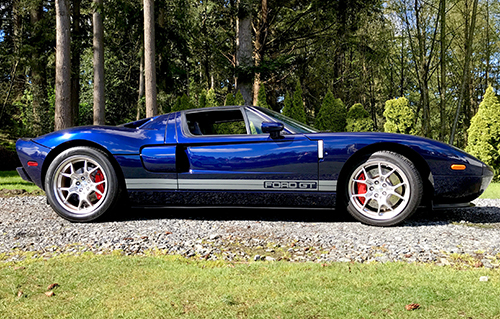 One of the great things about this car is Ford designed it to be an easy car to personalize and work on for the car enthusiast. 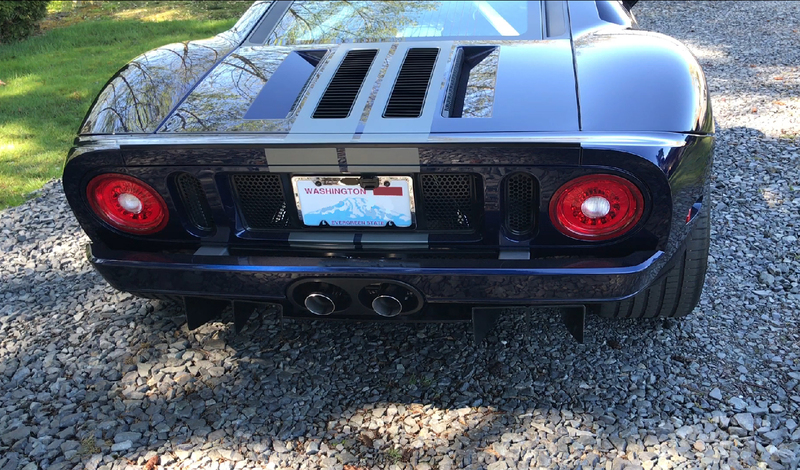 The first thing many owners like to do is modify the exhaust since this car is very quiet at idle and low RPMs. And, we are more than happy to oblige. 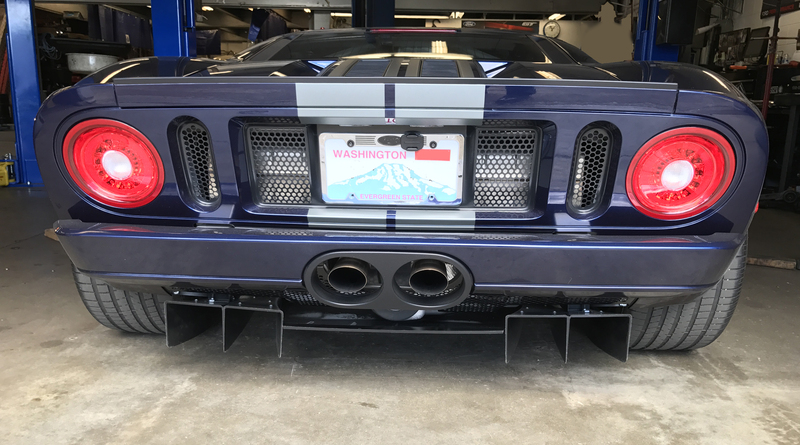 We had the pleasure of doing some service work and making a modification to the exhaust on this beautiful low mile Ford GT. On this car we are going to take off the stock muffler and in it’s place install an ACCUFAB X-Pipe. 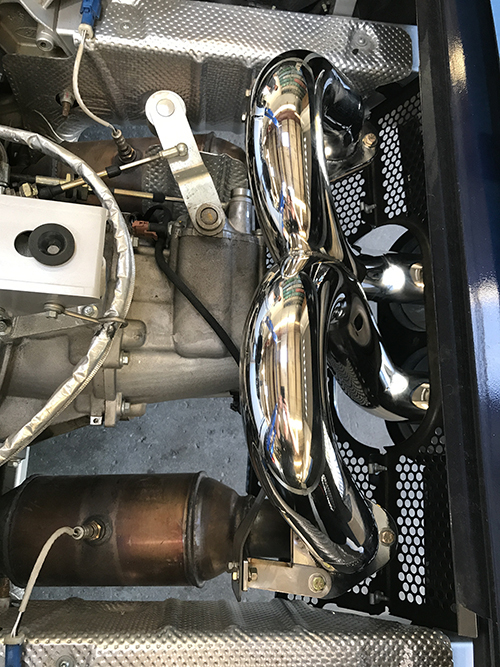 The nice thing about this modification is we have found it to have a great sound at idle and the lower rpm range without being obnoxious. It will make some noise on a hard acceleration though! Also, it doesn’t drone or cause discomfort inside the cockpit while driving. 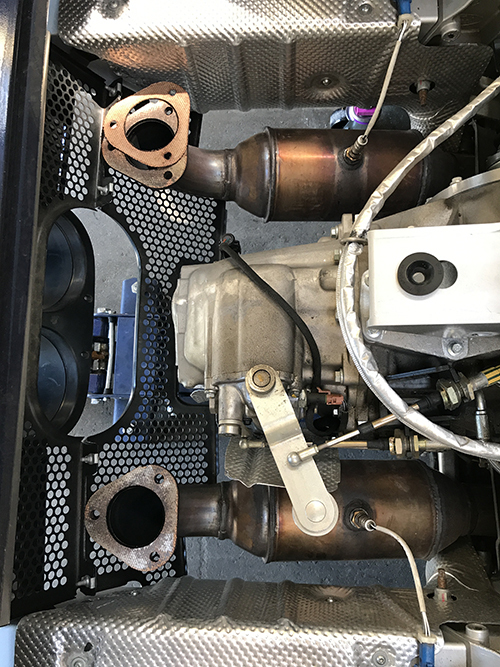 In the following photo you can see the stock tailpipes and through the lower mesh panel you can see the rear part of the stock muffler. This muffler is huge. It is also a fairly heavy muffler. It weighs in at 54 pounds! On these beautiful cars we always tape off the tail with blue painters tape and then remove the “Clam shell” as the Ford Engineers used to call it. This makes for easy access and less chance of any damage. We then remove the lower ground effects and set that out of the way. 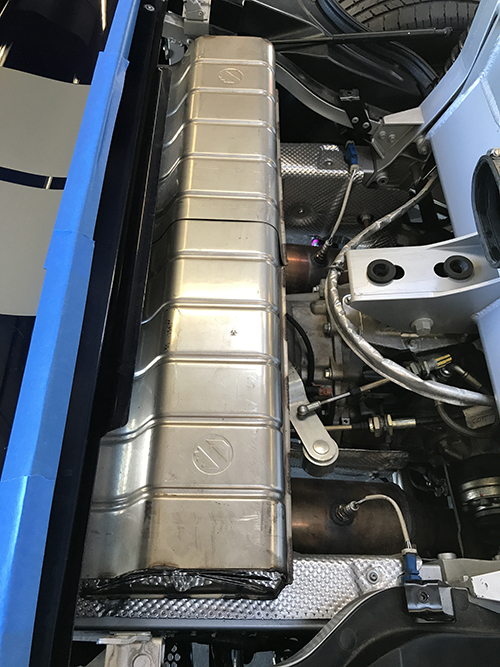 With the Clam shell off and the air filter housing removed you can see just how big the stock muffler is. 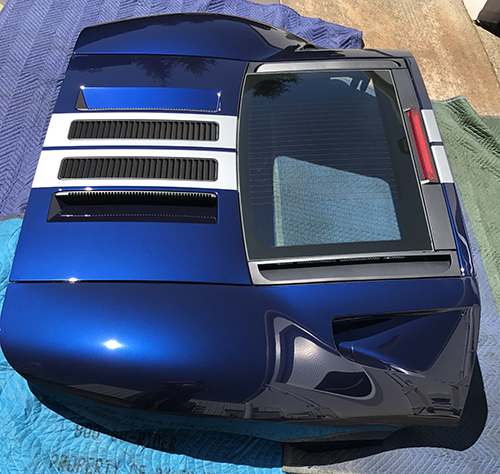 Accufab really does nice work. 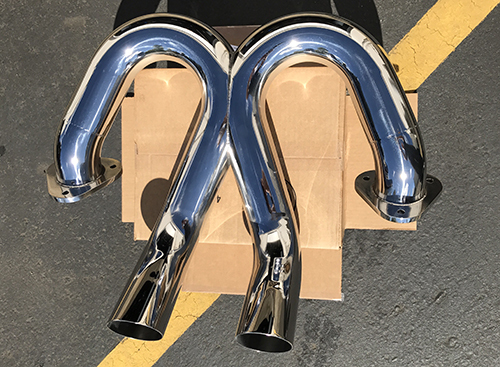 They have lots of great products from Throttle Bodies to exhaust for lots of different brands of cars and trucks. Check out the detail on the following images. Now we prep the Cat outlets for some new gaskets and the Accufab X-Pipe. Once it is on we center up the X-Pipe outlets and torque it down. Now it’s time to install the Clam shell and ground effects. Not only does it sound great, but looks great. 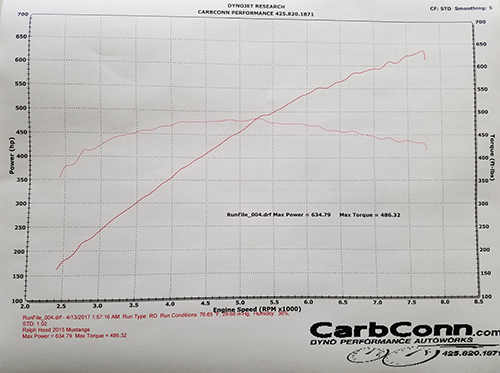 Below you will see the before and after sound levels from the stock muffler and X-Pipe. These readings are from the car being stationary and revving to 5,000 rpm. 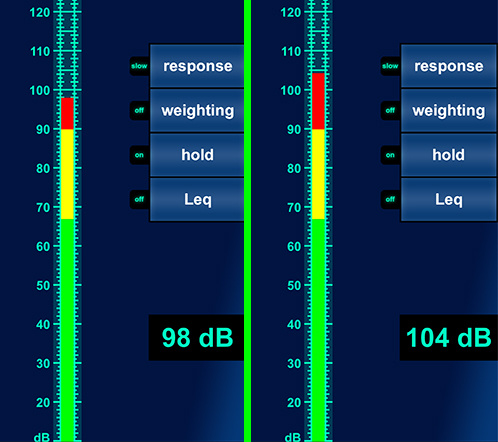 As you can see it is louder, but not obnoxious. Where you really notice the difference is at idle and when it accelerates away. It sounds awesome! I will upload the videos with the audio soon. 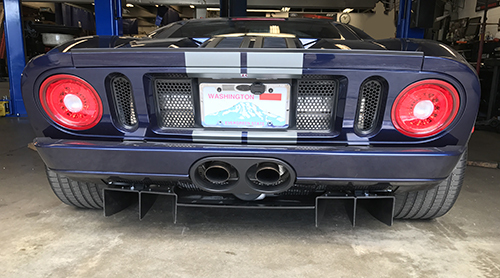 We have used Accufab Racing components on quite a few Ford GT cars and on Mustangs as well and have never been disappointed. Check them out at www.accufab.com ! Note: If you want to do modifications from mild to wild, we can do it. Roland “Buff” does just about any mod you’d like(he even let’s me help sometimes). 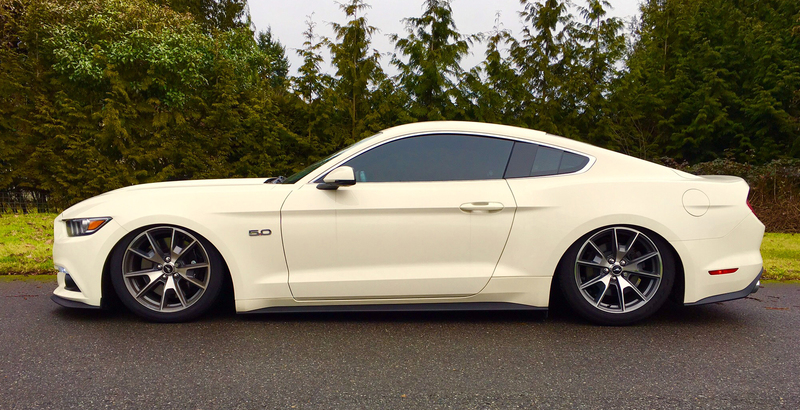 Lower it, bag it, supercharge it, lift it, we do it! Comments Off on Ready to Ruuuuummmmbbblleeee! We did a little grooming of the Mustang recently and while it was in we uploaded a new tune! Afterwards it made a visit to CarbConnection in Kirkland where it got to go for a full out run on the dyno to see what it had. It was not a disappointment! 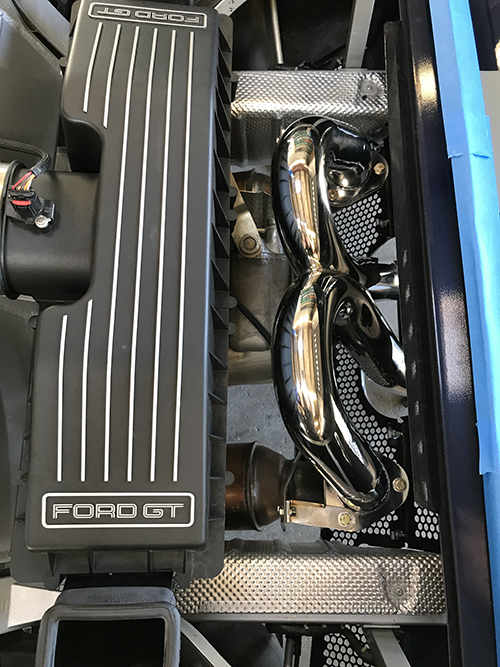 This awesome Mustang GT 50 Year Limited Edition is pumping out a few extra horsepower and foot pounds of torque after the addition of a Whipple Supercharger. 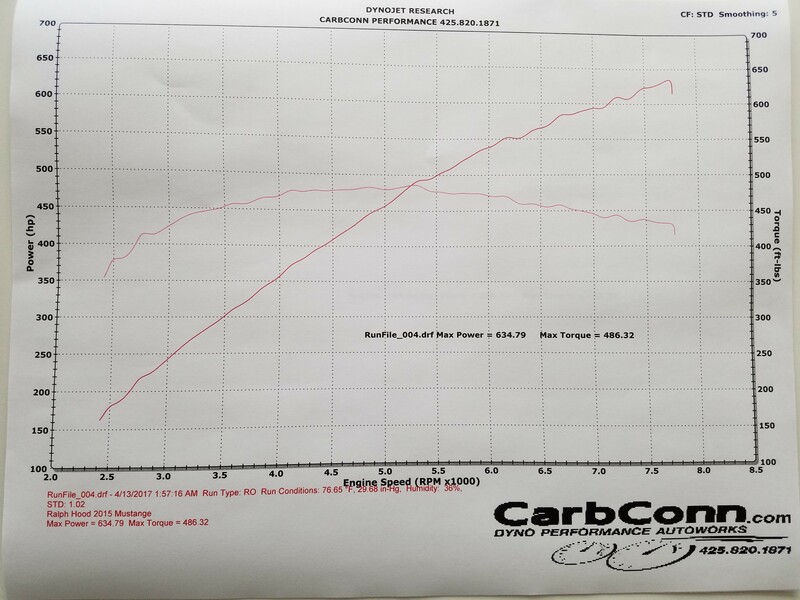 Stock horsepower is 435 and 400 lb-ft of torque(this is at the engine). The final run shows 634 hp and 486 max torque. This is at the rear wheels! That calculates to roughly 725 engine horsepower! Strong! Comments Off on Running the Mustang!